When a loved one passes, you and your family will be overcome with grief. Grieving is the open expression of your feelings and thoughts when a loved one passes away. This journey is just the beginning and it will most likely be painful, frightening, lonely and overwhelming. This article was created to help provide you with suggestions to help you move towards the healing process. Everyone’s grief is unique. No one grieves in exactly the same way. Your experience will be influenced by various factors: the relationship you had with the person that has passed away; the circumstances surrounding the demise; your emotional support system; and your religious and cultural background. You will grieve in your own unique way as a result of these variables. Don’t compare your experience with other people’s tragedy. Don’t make assumptions about how long your grief should last. Take a “one-day-at-a-time” approach; this allows you to grieve at your own pace. Express your grief openly with others. By sharing your feelings, the healing begins. Grief will not go away if you try to ignore it; communicating the grief you feel with others often helps tremendously. Remember to speak from your heart, not just your head. Sharing your feelings in this way doesn’t mean you are losing control, or going “crazy.” This is a normal part of the grieving journey. Express your feelings with caring family and friends who will listen without passing judgment. Seek out the people that will support you through this difficult journey. Avoid people who criticize the way you are grieving. Some people may advise you to; “keep your chin up,” “carry on,” or to “be happy.” These comments are well-intended, but you do not have to accept them. You have a right to express your grief in your own way; no one has the right to take it away. Experiencing the loss of a loved one affects your mind, heart, and spirit. You may experience many emotions throughout the grieving process. Feeling confused, disorganized, fearful, guilty, relieved, or explosive are just a few of the emotions you may experience. These emotions may follow each other within a short period of time or they may occur simultaneously. As strange as some of these feelings may seem they are normal and healthy. Learn from these feelings. Don’t be surprised if you suddenly experience surges of grief, even at the most unexpected times. These grief attacks can be frightening and overwhelming. They are, however, a natural response to the loss of someone loved. Find a confidant who understands your feelings and allows you to talk about them. Feeling dazed or numb when a loved one passes is often part of the early grief experience. This numbness gives your emotions time to catch up with what your mind has told you. This emotion creates insulation from the reality of death until you are more able to tolerate what you don’t want to believe. Feelings of loss and sorrow will probably leave you fatigued. The ability to make important decisions and to think clearly may be impaired. The low-energy level you feel may naturally slow you down. Respect what your mind and body tells you. Nurture yourself and rest daily. Although you may have lost your appetite try to eat balanced meals. Lighten your schedule as much as possible. Taking care of yourself means that you are naturally using your survival skills; it does not mean you are feeling sorry for yourself. Although reaching out to others and accepting support is often hard, particularly when you hurt so much, it is the most compassionate self-action you can do at this difficult time. It is healthy to find the support system of caring friends and relatives who will provide the understanding needed. Find those people who acknowledge your feelings and encourage you to be yourself. Whether simple or elaborate, planning a funeral does more than acknowledge the demise of someone you loved. It provides you with the support of caring family and friends. 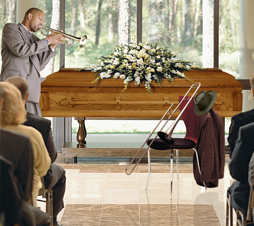 Most importantly, a funeral is an important way for you to express your emotions for the one you love. A funeral allows family and friends to begin the healing process. Most people often regret deciding to not have some form of gathering. This often causes repression of your feelings, and cheats everyone who cares out of a way to say their final good-bye. If faith is part of your life, express it appropriately in your own way. Choose to be around people who understand and support your religious beliefs. If you are angry at God because your loved one has passed away, realize this feeling is a normal part of the grieving process. Communicate with someone about your feelings of anger and abandonment. You may find yourself questioning, “Why did he/she die? Why now?” This search for meaning is a normal part of the healing process. Some questions have answers and some do not. Healing occurs in the ability to pose the questions, not necessarily having the ability to answer them. After experiencing loss, loving memories are one of the best legacies that exist. Cherish them. Reminisce with family and friends. The fond memories may make you laugh or cry. In either case, they are an essential part of the relationship that you had with that special person in your life. When you love someone and they pass, it is necessary to grieve. Healing occurs when you openly express your grief. Denying yourself the right to grieve only makes this difficult time more confusing and overwhelming. Embrace the grieving and healing process. Be patient and tolerant, grief is a process, not an event. Remember, the death of someone you love changes your life forever. You will experience happiness again but you must accept that life will never be exactly as before the death. Experiencing grief is powerful and so is the ability to heal. When you accept the grieving process, it moves you toward a renewed sense of meaning and purpose of life.